Elle is a beauty,but she needs a home without any cats or dogs because she is a loner.She is a Lovely cat that is spayed. large short haired tabby, female sprayed. Justin is a 2 year old approx neutered.Needs a good home. Great with dogs and other cats. Pixie is an older cat very over weight but starting to lose some weight. She needs a good home preferably with older couple or single person. new baby cat very sweet and playful. sweet baby boy, very lovable no name now.Loves to play! Rusty was very thin and lived on the streets. We had him neutered and he is a loving kind cat that needs a loving home. Roger short haired tabby handsome and is a good boy, Approx 2 - 3 years old. He is neutered and needs a great loving home,good with other cats and dogs. 3 year old male Jindo retriever mix, 55 lbs. He was rescued from the dog meat trade in South Korea October 10, 2016. 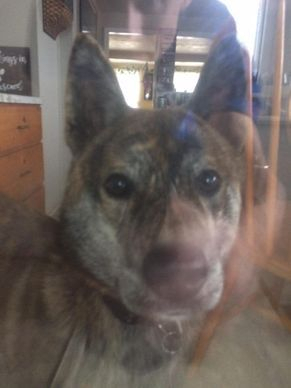 1 year old male brindle Jindo mix, 45 lbs. Neutered and vaccinated, very friendly.